Organic, raw, gluten free, vegan, and soy free. If you couldn’t tell from my previous posts, I love hemp, so the idea of a protein bar largely made of hemp definitely has some appeal. The flavor wasn’t particularly inspiring nor unpleasant in any way. It was somewhat sweet, yet savory, the dates that make up much of the bar are a large flavor component. 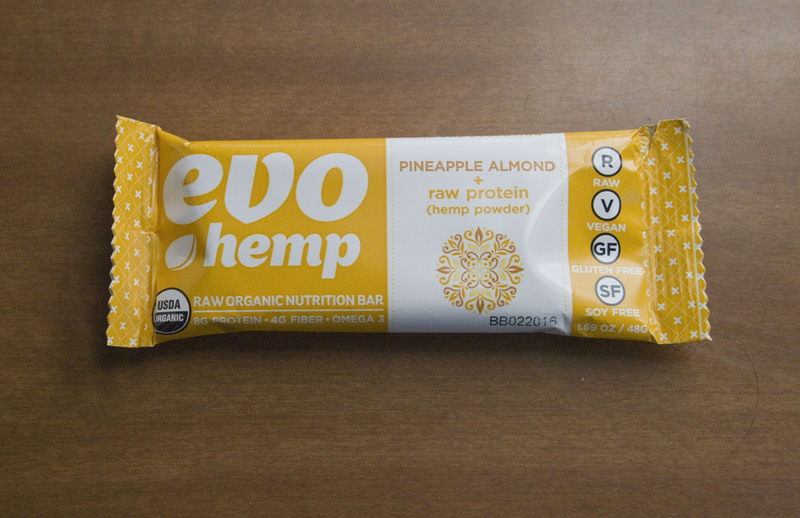 This Evo Hemp bar didn’t have as good of a flavor or mouth feel as the last one I reviewed for post #4, but it did have more protein, magnesium, manganese and other minerals. The protein per ounce ratio on the Evo Hemp bars isn’t as high as many of the bars I have reviewed but it also isn’t the lowest, and for the price it makes this a very well-rounded middle of the road protein bar, with a lot of auxiliary nutrients for those who need them. The extra minerals and bromelian from the pineapple would be a great asset for anyone who is mineral deprived or needs a little extra boost recovering from an MDMA hangover, which could be great at festivals like Burning Man (if you take MDMA). The lack of chocolate coupled with the bromelian makes this an ideal protein bar for Burning Man, especially if you intend to take MDMA out there.